Sock hop, hula hoop contests, Elvis impersonators! 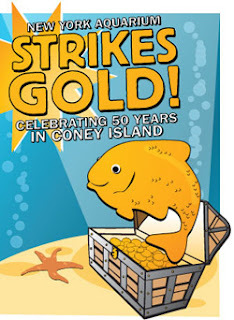 Join us for a special ’50s-theme weekend event honoring the Aquarium’s golden anniversary in Coney Island. Rock around the clock with live music by ’50s DJ Mike C., show us you’re hip in our hula hoop contest, and enjoy special ’50s sea lion demonstrations, stilt walkers, games, crafts, a vintage car show, and more. Free admission on Fridays through August 31 if you turn fifty this year and show them your ID. Us, we're hoping that they mark their 50th Anniversary by moving forward with the badly needed redesign and upgrade of the facility. Check out more detail over at Kinetic Carnival and at the Aquarium website.